Teaching is a calling. We have all heard it. Some knew it was their destiny from childhood. Others discovered later life that they were meant to teach. Being a teacher requires much more ability than mastering a subject. Teachers serve as surrogate parents, social workers, mediators, technology specialists and entertainers in the classrooms of today. Our Rotary Club serves as a major sponsor for the Greenville County Teacher of the Year program. Every resident in our area should have the opportunity to visit the classrooms of the top ten finalists. Each teacher had a unique teaching style that matched their personality. It is so challenging to compare a guidance counselor to a kindergarten teacher or a high school statistics teacher. They were all wonderful and it was clear that they each had found their calling. 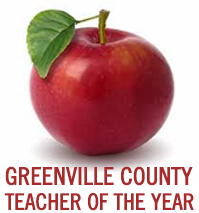 At our September 26 meeting, the Greenville County Teacher of the Year and the three runners-up will be recognized. Members will be able to see the passion the teachers have for their jobs as well as their students. Plan to be present to honor four amazing teachers.